RECIPE: WATERMELON BENEDICT - What About Watermelon? According to some folks, there aren’t many breakfast foods that are as easy and simply delicious as Eggs Benedict. Most people love the dish for the hollandaise sauce, which is a rich, creamy mixture of egg yolk and butter. I, on the other hand, am not a big fan of egg yolks, which is why I’ve always steered clear of eggs benedict when I’ve spotted it on a menu. Watermelon Benedict, on the other hand, is something I’d definitely try. Mainly because it uses lemon yogurt instead of egg yolks. And it uses watermelon. So, really, I have no reason NOT to love this breakfast! Mix the granola with the honey by drizzling the honey evenly over the granola as you stir. On a serving plate, make 3-inch circles of granola in even thickness, dividing the granola/honey mixture evenly among the servings. Top each of the granola circles with a watermelon slice and place a slice of kiwi on each watermelon circle. 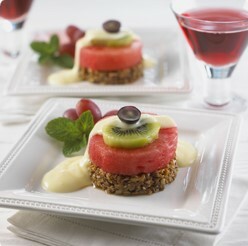 Spoon the yogurt over the kiwi and watermelon as though it were hollandaise sauce on Eggs Benedict. Top each Watermelon Benedict with a grape half; skin side up as a garnish reminiscent of the olive slice on Eggs Benedict. Serves 4-6.
of the National Watermelon Promotion Board website.